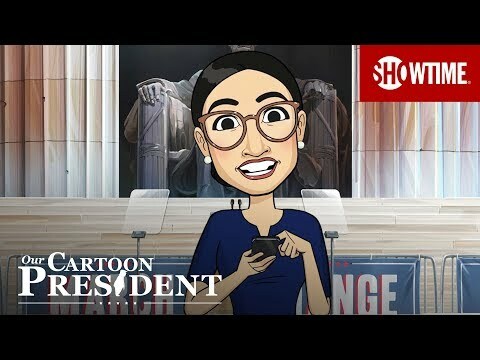 SHOWTIME will premiere the second season of its animated comedy series OUR CARTOON PRESIDENT on Sunday, May 12 at 8 p.m. ET/PT, and will feature an animated appearance from Queer Eye's Jonathan Van Ness. Season two features President Trump trying to convince the American people that he's the greatest, least criminal president in history as House Speaker Nancy Pelosi and Senator Chuck Schumer attempt to win back the Democratic base from newcomer Alexandria Ocasio-Cortez. Episodes include - Trump convincing the American people to pay for Trump Tower-Moscow, proving he's mentally fit enough to possess the nuclear codes and solving climate change to stop his sweating problem, all with help from his cabinet and kids Don Jr., Eric and Ivanka. The series will also follow the candidates fighting for the 2020 Democratic nomination - including Beto O'Rourke, Kamala Harris, Bernie Sanders, and Pete Buttigieg - and introduce new characters Kellyanne Conway, Elon Musk, Jeff Bezos, and My Pillow CEO Mike Lindell. The upcoming Our Cartoon President Season 2 Showtime release date is May 12, 2019 in the US. Notify me when Our Cartoon President Season 2 is available.